Paoloni sets the standards in the field of entry level Beamsaws. The aim of this innovative technical solution is to reach high performance while at the same time offering maximum precision, all this without overlooking the special characteristics of the KR32 and KR43, such as ergonomics, small machine dimensions and great simplicity of use. 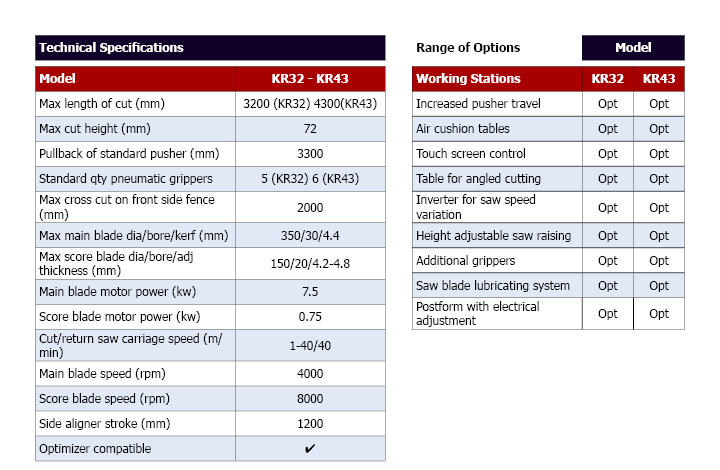 These features make the KR32 and KR43 the reference panel sizing centres in their category. The machine can be supplied with on board optimisation as well as the ability to work with other optimisation packages.